It seems the Labconco Freezone 6 w/ Stoppering Freeze Dryer Console Stoppering Freeze Dryer ID #: 16216 has been sold and is no longer available. Looking for similar items? Click Here to easily view our available inventory similar to your search. FreeZone Plus 6 Liter Cascade Console Freeze Dry System is designed for light to moderate loads of low eutectic point samples. Removes a maximum of 4.1 liters of water in 24 hours. * Includes brushed stainless steel and powder-coated steel exterior; stainless steel collector chamber and coil; LCD that displays system operating parameters, set-up parameters and alarm messages (choice of temperature in °C and ° F, choice of vacuum in mBar, Pa and Torr); two 1/3 hp CFC-free refrigeration systems; red alarm light; LED vacuum and temperature wave graphs; patented moisture sensor; vacuum control/break valve; rear-mounted RS-232 port; automatic start-up switch for collector cool-down and vacuum pull-down with manual override switches; hot gas defrost and switch; retractable collector drain line; 3" diameter port for connection of drying accessory; power switch; rear-mounted electrical receptacle for vacuum pump connection (pump not included); 3/4" OD vacuum connection; 3/4" ID vacuum hose; and two clamps. Lyophilize and stopper multiple vials under vacuum using the FreeZone Stoppering Tray Dryer, or freeze-dry batch samples for bulk processing directly on its three shelves. A digital display allows the user to program the set point temperature. Holds up to five programs of up to five segments each, with memory for repeating protocols. 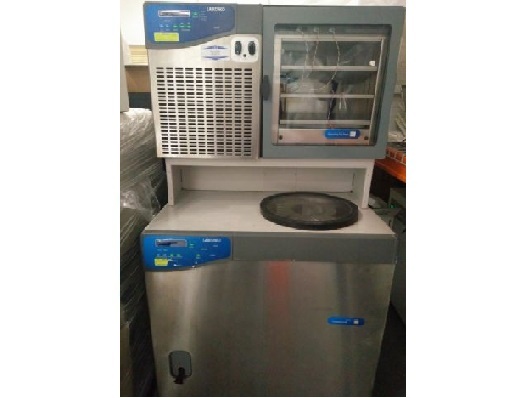 Thank you for your interest in the Labconco Freezone 6 w/ Stoppering Freeze Dryer Console Stoppering Freeze Dryer (ID #: 16216). To speak with a representative, please fill out the contact form below or call us directly.